Poppies, both buttercream and the classic WWI variety, were a great success, sowed in late February and blooming in mid- to late May. Meanwhile, as you can see from the fallen petals above, the columbines self-sowed with great vigor. You would hardly know that the great culling of 2016 had ever taken place! Here’s the sunny garden, still chock full of blue columbines (plus the purple allium ‘Sensation,’ I think). I am continuing to pull them out once they’ve seeded, so I’m probably not making much progress… I do try to shake the interesting colored ones, like this white one, in hopes that they’ll spread and grow next year. Additional seeds are sugar snap ‘Anna,’ doing very well this year after a slow start (I sowed them in February but they didn’t do anything for about a month); zinnias and cosmos; and some vines for the trellises. They’re up but not doing much yet. And today, February 19: Tête-à-tête dafodils in the front garden, hellebores front and back (in bloom for some time), and more of the delightful Tommy crocuses. It’s not even the end of February, but we’ve already had several days in the 60’s, and today is predicted to be in the 70’s, for heaven’s sake. Meanwhile, the ground is as dry as dust, as I know from having seeded a few favorites yesterday and today. I’ve had mediocre luck with the incredibly easy sugar snap peas the last few years, but I’m trying yet again. I have Sugar Ann left over from last year (Roxbury sells loose seed, and the smallest amount you can get is a quarter pound @ $1.50). I sowed it very thickly in the raised bed in hopes that half of it will germinate. Here’s what it will look like if all goes well. Thanks again to Adrian Higgins who recommended sowing poppies in February. It certainly worked last year! It has been raining almost every day for about a month, and we are sick of it, as you can see from this extremely witty Facebook post. Even someone like me, who welcomes a rainy day as an excuse to quilt and read, is getting weary. We had one sunny day last week, and the air was ringing with the sounds of lawn mowers. I was able to edge the sunny border, fighting with the witch grass all the way, and started to replenish the soil in the newly installed raised bed. Rainy today, Sunday, and predicted to go on until some time on Tuesday. And to top it off, we are still in a rain deficit for the year! On another note, garden bloggers’ Bloom Day has come and gone yet again without a post from me. Here is a reconstruction, and a list from 2014 (another of those pieces of paper that floats around the kitchen counter until needed). This year is much the same, except that mid-May this year found nary a trace of the mazus and wild columbine, both lamented. I think the hellebores might have crowded out the columbine. 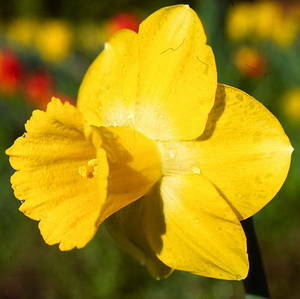 The Topolino daffodil again was the last to bloom and is most welcome. ‘Sarah Bernhardt’ is in bloom, as gorgeous and over the top as ever. Equally magnificent in a very different way is the Jack in the pulpit that either Becky or Judy passed along to me. It seems to be very happy in this cool, wet spring. Thanks to advice from Adrian Higgins, I sowed my Shirley poppy seeds in February and hoped for the best. They were just lying around, so why not give it a go? Lo and behold, it worked! This gorgeous red is a good contrast with the blue columbines that have taken over the garden (their days are numbered if it ever dries out a bit). The akebia vine just sits there most of the year, putting out tendrils that want to conquer new territory but never quite getting there. By February it is looking ratty, and then the transformation happens. New leaves appear, it looks happy and healthy and, best of all, the tiny flowers bloom and release a heavenly scent. I wish you could turn on your Smell-o-vision and experience it the way the bees and I do. The birds like it, too, and I think the wrens may nest there. Whether they appreciate the scent as much as I do is an open question. Searching for spring ephemerals the day before St. Patrick’s Day was a great idea, but in reality the weather was hot and humid in this weird spring. Nevertheless, we did spot a few joys, thanks to Ann’s sharp eyes. Bluebells just emerging, and leaves of trout lilies promise flowers later. I think this is some kind of spurge (euphorbia), of which there are about a zillion varieties. A true ephemeral, claytonia virginica, aka spring beauty. You can just make out the helpful lines on the petals so that pollinators can find what they’re looking for. I kept calling this witch hazel, but I think it is actually spicebush. Ann knew what this was, though it’s hard to make out in this picture. Shadbush is also called shadwood or shadblow, serviceberry or sarvisberry, or just sarvis, wild pear, juneberry, saskatoon, sugarplum or wild-plum, and chuckley pear, according to Wikipedia. No walk is complete without wildlife. We admired this shiny fellow along the path. grape hyacinths – modest little bulbs but I want to add more for a sea of blue. I like the contrast with the red blossoms from the maple. daffodils – the cutting garden is doing well (I’ve already cut several dozen in the last few days), and more are in bloom under the oak tree and outside the shed. I need some in the front garden. speaking of blue, the blue anemones seem to be the only ones to survive. They do well in sun and are not showing at their best on this cloudy morning. They would look great under the maple tree. Next year? and finally, leucojum ‘Snowflake’ – this one is in the bed with Bishops weed, so I rooted out both the weed and some of the leucojum a year or two back. It seems to be thriving again. It makes a very sweet tiny bouquet that allows you to see the delicate green lines on each petal. And, of course, dandelions, myrtle and forsythia, all appreciated but too common to record. 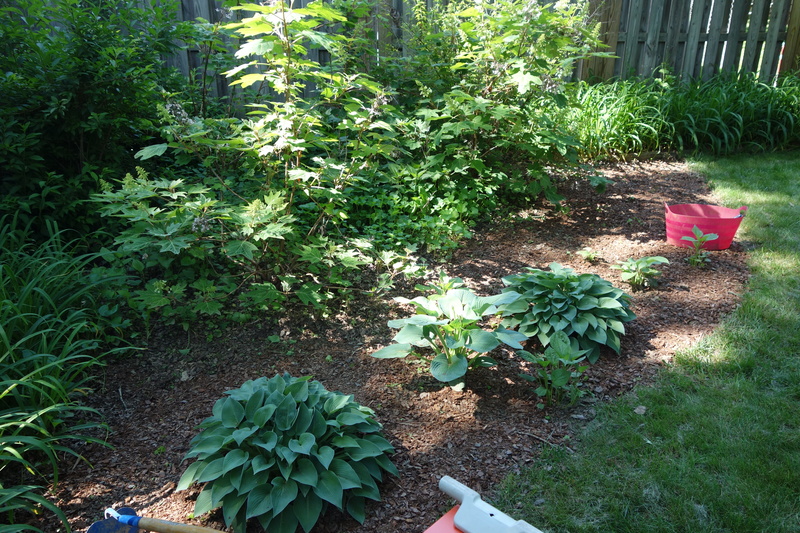 Otherwise, plenty of buds are swelling – not just the maple but also the bottlebrush buckeye and the hydrangeas. 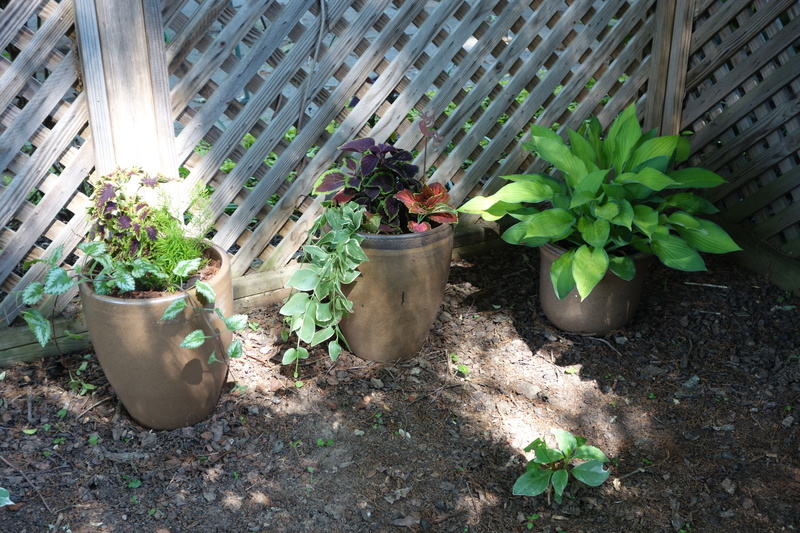 Still to do: plant nicotiana seed in the terrace beds, plant vines around mailbox and in front of rose(-less) trellis, clean up mailbox bed, plus a ton of other things too numerous to mention. There is one more day to the weekend, so there’s hope! We interrupt this blog for a special garden message – or maybe it’s time to stop blogging about travel and get back to the garden now that spring is here. We’ve had a long, cool spring without more than a couple days in the eighties, so nothing has been cooked to death. In fact, I still have daffodils in bloom, a new to me species called ‘Pay Day.’ Yellow with a touch of white and very welcome even this late in the season. Here’s a picture thanks to Brent and Becky’s Bulbs, where I think I bought it. Earlier this week, just in time for Garden Day, we had a deluge of up to four inches of rain. 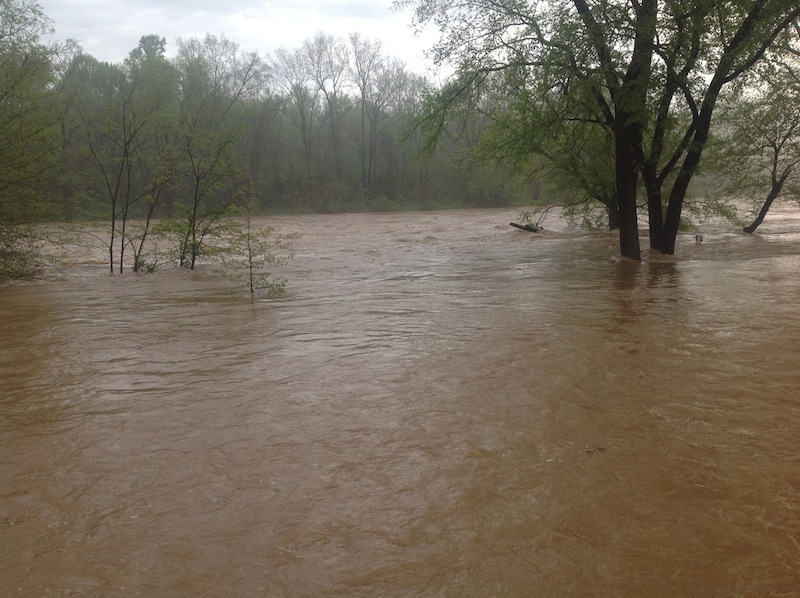 I’ve never seen the Rappahannock so high – from the Chatham bridge, you could almost reach out and touch it. Here’s a photo from the Free Lance-Star. Now it’s sunny, breezy and magnificent, perfect gardening weather. So much is in bloom, in fact, that I compiled a list. Geranium maculatum ‘espresso’, False Solomon’s seal, small white allium, a gray blooming bulb that I can’t identify, hellebores, mazus reptans, bluebells, tulips (going by), blue columbine and wild columbine (which has gotten huge), sweet woodruff, tiarella, euphorbia, vinca, sorrel, Star of Bethlehem, dandelions, Viburnum ‘Shasta’ which looks lovely backed with the neighbor’s pale pink dogwood, bleeding hearts both red and white, ‘Sherwood’s Purple’ phlox which has gone to town under the oak tree, Delaware white azalea, garlic mustard, geranium macrorrhizum, bugleweed, lily of the valley, pink azalea, coral bells, ‘Sun Dial’ narcissus, pansies, lily of the valley ((one lone one) and baptisia australis. Whew! I’ve planted black radishes, Yaya carrots, cilantro, and tatsoi from seed, and so far the radishes and tatsoi are coming up. I totally missed the window for peas and sweet peas and will vow to plant the latter this fall.